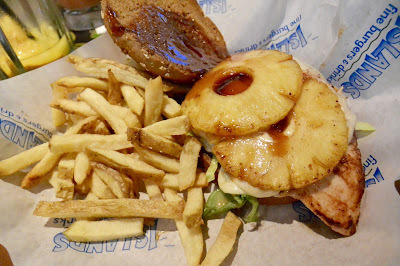 Pineapple Season Tasting at Islands Burgers - San Diego Dining Dish! Pineapple season is in full swing, and although California might not have the famous pineapples of Hawaii, we still have access to some of the freshest, juiciest pineapple. To celebrate, Hawaiian-themed San Diego institution, Islands Burgers, has created a pairing menu of their famous burgers and sandwiches with their signature drinks. The Hawaiian burger and the Toucan chicken sandwich both feature pineapple slices with teriyaki sauce, combining a sweet and salty amazing flavor! 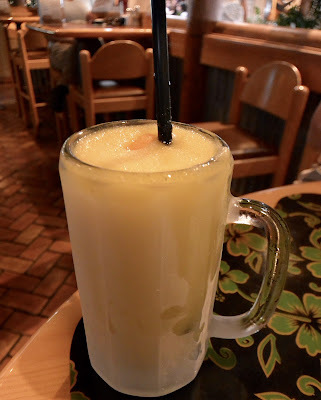 Pair one of these with the Big Island Iced Tea and you're in pineapple heaven. We love pina coladas (yeah, now you'll have that song in your head), so we decided to have our pineapple frozen with coconut! 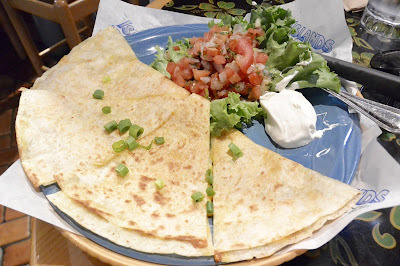 Happy hour includes some great drink and appetizer discounts, so we started with the quesadilla. Filled with cheese and Hatch green chiles, the quesadilla was a step above your normal cheesy tortilla dish. It was huge, so a great start to the dinner. The Hawaiian burger is one of the signature burgers for this Hawaiian-themed restaurant, and for good reason. Pineapple works so well with savory foods, as Hawaiian pizza lovers know, bringing a new flavor and dimension to the salty with a burst of juicy sweetness. 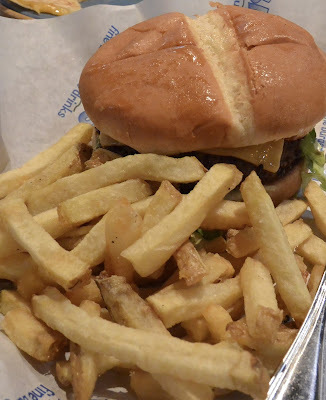 As always, the burger was cooked to perfection, with the fresh cut Island fries crispy and delicious. The Toucan is essentially the same sandwich as the Hawaiian burger, but instead of a burger, the sandwich is made with a grilled chicken breast. The pineapple and teriyaki sauce pairs amazingly with the chicken, creating a wonderful flavor and texture. The pineapple pairing menu is available through May 31 at all Islands Burgers locations. Stop in any store and check it out!